In this article, we explain the legal situation for the use of drones in Italy. On the Internet, there are many different views on the laws in Italy. As in most other countries around the world, Italian lawmakers also differentiate between private (model airplanes) and commercial use of multicopters. Is registration required at ENAC? Registration with the ENAC is not required for private drone users, even if the drone has a camera installed. That was the biggest issue in the past. However, the ENAC makes it clear on its website that even model airplanes are allowed to take amateur photos without registration. You can also publish such aerial photographs in private networks on social networks. Many of our readers have already received this interpretation from the local authorities. If you want to fly in Italy with a drone, the following conditions have to be fulfilled. Maximum flight altitude: In Italy, the maximum flight altitude for private drone operations is 70 meters, and commercial copter flights are 150 meters. Maximum horizontal distance and FPV: There is a limitation in Italy on how far a drone can be removed from the pilot. This limit is for private pilots at 200 meters and commercial pilots at 500 meters. Compulsory insurance: For Italy, a drones liability insurance is necessary, which covers damages of at least 750.000 euro. Maximum take-off weight (MTOW): 25 kg is the maximum weight limit for private pilots. Distance to airports: Drones have to keep a distance of at least 5 kilometers to airports. Other safe distances: Private drone aviators may only start in undeveloped areas and have to maintain sufficient distance to buildings of all kinds. Flight bans: In Rome, over the Vatican and in Venice (including associated islands), flight bans for drones apply. In other cities, too, I would not start my drone unless I obtained the approval of the local authorities (such as the police or the magistrate). A reader of our blog knew nothing of it and was arrested on suspicion of terrorism because he flew in Rome with his copter. Newspapers also repeatedly report arrests of major sights such as at the Colosseum or in the Vatican. Also, it is forbidden to fly on beaches, if there are other people there. Time of operations: Drones flights are permitted only in daylight. Approvals for night flights can be requested. Regulations for commercial pilots: The requirements for commercial copter pilots differ according to the type of flight maneuvers envisaged. For low-risk operations, it is sufficient to submit a statement of compliance with specific requirements. There is a processing fee of 94 €. For drone flights with higher risk, additional requirements (certification, health certificate, training certificate, etc.) must be met. More information can be found on the ENAC website. Regardless of the risk assessment, any commercially used copter must be registered and marked with the registration number. Good to know: Frequency determinations for FPV on 2.4 GHz and 5.8 GHz with a maximum of 100mW possible. We have researched the listed drone regulations for Italy to the best of our knowledge. We can not guarantee the correctness of the information. If you want to be on the safe side, please contact the competent aviation authority. Alternatively, you can also ask the embassy in your country for further information about the regulations. Please leave us a comment when you receive news and/or gain experience with your copter in Italy! Hi Guys, this is the second time I bumped into your blog while checking regulations in different countries. Congratulations for you blog and thank you for your service. I’m about to go to Italy and, there’s a question I have about their regulations, but, not towards the flying. I just want to know if I can take the drone in my backpack and there won’t be any trouble in the airport. I’m coming from Portugal by the way. I’m making this question because the first time I was researching regulations for Oman, and realised there are complications just for getting in the airport with the drone in the backpack. I’m hoping that travelling inside europe, between 2 countries of the EU, that will be simplified. But even so, I’d like to know your opinion about it. Nice to have you here! 🙂 I don’t expect any issues at the airport. Have a wonderful trip to Italy! Can I fly a Mavic Air while hiking in the Dolomites and Lake Brais? Should not be a problem as long as you are not in a National Park and you follow the Italian rules. I was in the Lake Brais this January and saw a sign that prohibits drones. Francis, the insurance is not compulsory for recreational use (not professional). It is suggested but not compulsory. Okay, thank you for this correction. Do you have a trustworthy source for me? Hi, i’m Italian and I can confirm that for recreational use insurance is not mandatory. Flying on beaches is not forbidden as long as there are no people around! In italy is not easy to understand where you can and you cannot fly, you should use italian aeronautical maps to be sure. I am visiting Naples, Positano, Sorrento, and Capri in mid-May. Can I fly my DJI Mavic Air? I am looking to fly over the water, mountains, and the house we are staying in. I am going to Italy, and more specifically to Lake Como. And also to Courmayeur, If I can fly there Mavic pro? 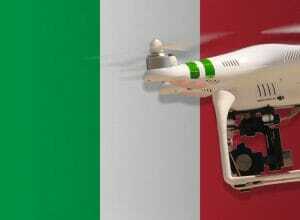 Can I fly my drone for commercial use in Italy without a license or do same rules apply such as in the US? I will be visiting Finale Ligure from 8-18 Sep. I found information that I cannot fly over beaches in summertime – usually until 15th September. Where can I check or asked if summertime locally has ended? Can I fly my drone in Cinque Terre from water? Is this possible, or do I need to ask for any permitions? Hello, ı will visit Florence,Cinque Terre and Genoa. How can ı fly my djı spark ? is it possible to use in these places? or do you know any exact place to fly? It is not allowed to fly a drone in urban areas without permission. Have a nice time in Italy!